New section for those of your with 4x4 hoops! I have just added a new section for those of you who have those wonderful machines that only do a 4”x4” design. This is the size of my granddaughters’ machine so I have made her some designs so she can embroider her own things. I thought that many of you may have trouble finding designs that fit your 4”x4” machine. So, I created the category “Under Rylo’s Umbrella” which will have all the designs that can do 4”x 4” embroidery. This will make it easier for you to find the designs that will fit your hoop. If the file has larger sizes, they are still in there. I did not take them out as you may get another machine someday that can use the larger designs and you will not have to purchase the design again. I will be adding more to this category so check back often. Below is a preview of what’s coming. A collection of an adorable little girl and her kitty. A collection of whimsical hearts and cute little bugs. This month has flown by, is it already the 20th? I have been very busy digitizing and testing new designs and ideas. Can’t wait for you to see them. Since you stopped by, let me tell you about the new special. Clothesline Weather Set of 6, is on Sale for $3.00. If you want to buy an individual one it is on sale for $1.00…What a great deal! In the coming months, I will be posting more tutorials, videos and a bunch more designs, stop by often for what’s new! I have embroidery software classes to teach tomorrow so I must get the tutorials printed. Have a great day!! Where has December gone? I hope you are ready. I just finished my last gift, now to get them wrapped. So, for those of you that are still in the throws of getting your Christmas embroideries finished I have a 2018 Christmas Special for you! Purchase my new Mylar Whimsy Christmas Tree for $1.99 and get Candy Cane Holiday Set for FREE! A $9.95 value if purchased individually...WOW! This is in the SALE Category only here at bluebunnyhollow.com. Get yours now as it will only be on special through Christmas Day! Merry Christmas! I hope you have a fabulous Christmas and a very prosperous and joyful New Year. Enjoy your family and friends, hug them all and we will see you in 2019! I hope all of you had a chance to download all the free Holly Alphabet and Numbers sets and are making some awesome holiday gifts and decorations. If you send me picture of what you made with my BBH embroidery designs to fluffles@bluebunnyhollow.com, I will send you a coupon code for 50% off your next design order. This would be good until the end of 2019, so if you do not see anything right away, hold onto the code and keep checking back until you find something you like. If you did not get all the letters and numbers, they are available and only $1.00 each. I will be doing another free alphabet set after the first of the year, so look for that. I will send out an email, post it on my Facebook page, and here to let you know. 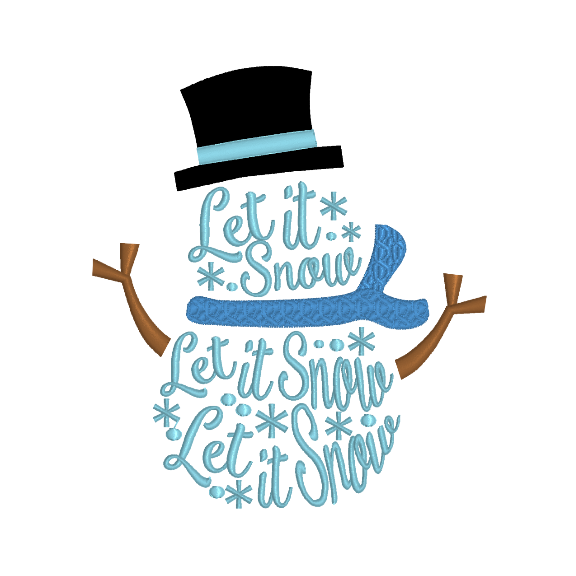 New designs have been posted to the website, “Gingerbread Cottages” and delightful applique design (set of 6) that is on SALE right now for 50% off, “Let it Snow” and Santa Claus are only $1.50 each. Santa Claus has a Mylar background for the fun, festive look! Have a look around the Hollow. The fluffles (wild bunnies), fluffles administrator and fluffles assistant enjoy having your company. From all of us at Blue Bunny Hollow have a very Merry Christmas and Happy New Year!! I am so excited to get this holiday season rolling. I have just posted some new Christmas designs and more are in the works. But, the best thing is the FREE stuff! Starting on November 23rd and ending on December 15th, you will be able to download letters and numbers from Holly Alphabet and Holly Numbers set. Each day I will post 2 designs, either numbers or letters, your gift just for stopping by bluebunnyhollow.com. Each pair of letters and numbers will be available for 3 days so you have plenty of time to download the free gifts. That’s is a great deal…26 letters and 10 numbers for FREE!! They will be in the FREE section labeled “On the Hollow”. November 23-25 will be A and B, November 24-26 will be C and D, November 25-27 will be E and F…etc. Thank you for joining me today! Browse around the hollow for some cool designs and products. Yes, you read that right…I have added Christmas designs! There are some of you out there that like to get started early…real early. As I have been doing Sew Fun presentations, many people are already showing the Christmas presents they have made during Show and Tell. Wow, that’s organized! Speaking of Sew Fun, if you live in the Seattle area check out Quality Sewing’s Sew Fun program. I am one of the educators this month and we are having a lot of fun. You can get the schedule at qualitysewing.com. Come and join us, have some cookies and coffee and let us entertain, teach and show you some very cool samples. Also, hop on over to the Blue Bunny Hollow Facebook page and click LIKE, to like the page and like or love everything posted...just saying! It helps as Facebook keeps changing things. One last thing…If you use any of the designs from this website, please send me a photo so I can start a gallery of your cool stuff. Thanks for stopping by the Hollow! I have been working diligently on getting my hands-on classes ready for September. Digitizing designs, embroidering, sewing, quilting, cutting kits, and writing tutorials. Speaking of tutorials, have you seen that I have my September software class tutorials in the shop. The download includes a pdf tutorial that you can print out with icons, illustrations and pictures to help guide you through Floriani Total Control U and Premier+ software. Plus, a video to help you every step of the way. PEDesign 10 will be up soon. I also hope to have other software tutorials posted at a later date. These are for personal use only, not to be used in a private or public class. This is mainly an embroidery website, however, most of us do more than embroider…like quilting. If you love ruler work like I do then you probably have lots of templates for quilting. If you have problems with them slipping while you are quilting, then try my new product, Template Stay. Click on the video on the description page to see how it works. I have also started a new “On the Hollow” category where I will post items for $0.00… that’s correct…FREE! Right now, there is just 1 design, but I will add additional designs and include tutorials, videos and more. So, take your time and browse around the hollow for some cool designs and products. WOW! Does Time Fly when you are embroidering and doing creative stuff!!! I did not realize how long it has been since my first blog post. With that said, I am getting new designs posted this month and working on some products, tutorials and of course, more designs. I am also just finishing a new embroidery design set. I will post it in September. This one is amazing as you decide how you want your design to look. Do you want a standard embroidery or HTV (Heat Transfer Vinyl) for the fill areas? Maybe the artist in you wants to color the designs with crayons, colored pencils or inks. This pack will be jammed full of instructions to show my how to’s on IMC (Intense Melted Crayon) Fabric Coloring, LCP (Luxurious Colored Pencil) Fabric Coloring, or VIC (Vibrant Ink Coloring) Fabric Coloring. But why choose…try them all! A Blog for my FLUFFLES! Welcome to Blue Bunny Hollow! Hi, my name is Lana L Jones, thank you for visiting this new embroidery design shop and blog! During the past 20+++ years I have cultivated my sewing and embroidery craft starting at 7 years old when my mom showed me how to use her Singer Featherweight, which I still have today. I discovered my passion for education 25 years ago when sewing became my full time career. I teach classes, do events, lecture/demos, write books and create video tutorials for sewing, embroidery and embroidery software. My latest endeavor has brought about this new embroidery design shop. The launch of this site comes after years of corporate work, my two children who became respectable adult humans, then two grand dogs and a few years later two grandchildren! All the while, I was honing my craft, perfecting my teaching style and embroidery digitizing abilities. I am super excited to launch this website to share with my clients, customers, friends, family and the world! My daughter set up my new website...YAY!!! With the new website we are also launching the Doggie Dining Mat and Doggies Rule Design Pack in the shop. Individual designs are for sale as well, if you prefer not to buy the whole pack. We also plan to have many more design products, blanks, tutorials, and instructional videos in the coming months! The next product I would like to share with you is my newest embroidery design set named Crystal Lemonade. This design set features mylar (see glass of lemonade below) to create the look of crystal! It sparkles and looks great on kitchen towels. But, on the table runner I used organza instead of mylar for a very different look. Lovely and coming very soon! Thank you for joining me and reading my first blog post.